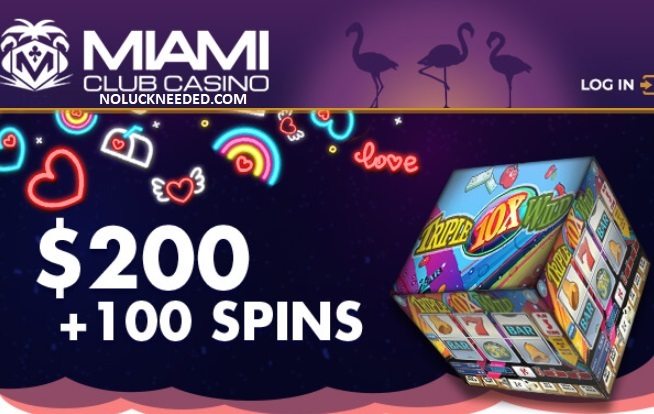 Make this your lucky day at Miami Club Casino with a 100% bonus up to $200 and 100 added free spins on the Triple 10X Wild slot. Redeem the coupon code ROMANCE to claim your bonus and free spins by February 14th, 2019. Check the bonus terms and conditions before you play. Good luck! No maximum cashout. *Coupon valid for 1 purchase between Feb 8 and 14 2019. Minimum deposit is $25. Maximum bonus is $200. Free spins are 1 cent on all paylines. Standard terms and conditions apply. *Maximum cashout rule, wagering requirements and game restrictions apply. Redeem the coupon in the cashier. $5000 February Month Long Tournament for $5! Prizes - TOP 55 PAID $25-$1500; 1st Place: $1500+; Entry is $5 and for that you get a starting balance of $150. Re-buys are unlimited and cost $5, for that you get $100. Prizes - TOP 15 PAID $10-$200+50% prize pool; 1st Place: Entry is $0 and for that you get a starting balance of $100. Re-buys are unlimited and cost $3, for that you get $100. Claim Your Triple 10X Wild Free Spins at Miami Club Casino! Miami Club Casino is a WGS (Vegas Technology) software online casino and a proud member of the award-winning Deckmedia (SlotoCash) casino group. Miami Club is a certified and recommended casino due to reliable player payments and good customer service.Click here to read Miami Club Casino reviews and ratings in the NoLuckNeeded Casino Directory. Miami Club Casino has added new cryptocurrency banking options including Bitcoin, Litecoin, and Bitcoin Cash.